Yaaaay! 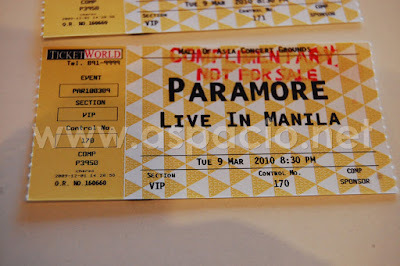 My wife and I are going to the Paramore concert on March 9, 2010, 8:30 pm at the Mall of Asia concert grounds. This afternoon we got the complimentary VIP tickets from a friend who is also the owner of the restaurant Little Asia which has a branch in the Venice Piazza in McKinley Hill in Taguig City. I am now brushing up on my knowledge of the band and their songs and am excited. The last rock concert I went to was when another Christian professing group (P.O.D.) had a concert here in Manila. I am more excited now because for the first time I will be watching a rock concert with my wife. It's a cool date alright! I'm not a big fan of Paramore but I know their songs... Cool band. And the get around, too. They'll be here in Vegas at the Hard Rock on May 16.